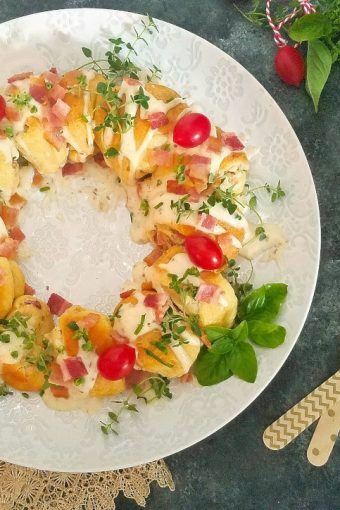 This Bacon Cream Cheese Breakfast Ring is an easy and delicious eye-popping dish made from bacon, onion and chive cream cheese, and crescent dough. It is perfect for the holidays and other occasions! It’s that wonderful time of the year again, folks! As you know, food plays a huge role in it all! With that in mind, we made this SUPER easy and delish Bacon Cream Cheese Breakfast Ring –a party for the mouth… and for the eyes too! This screams celebration-made-easy! 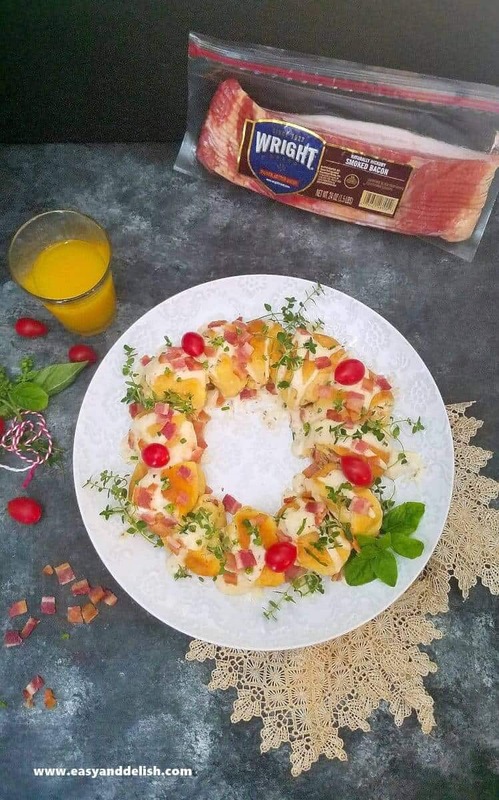 This Bacon Cream Cheese Breakfast Ring is made from staple ingredients such as crescent dough, cream cheese combined with onions and chives, and Wright® Brand Hickory Bacon –which is hand-trimmed, hand-selected, and naturally smoked. 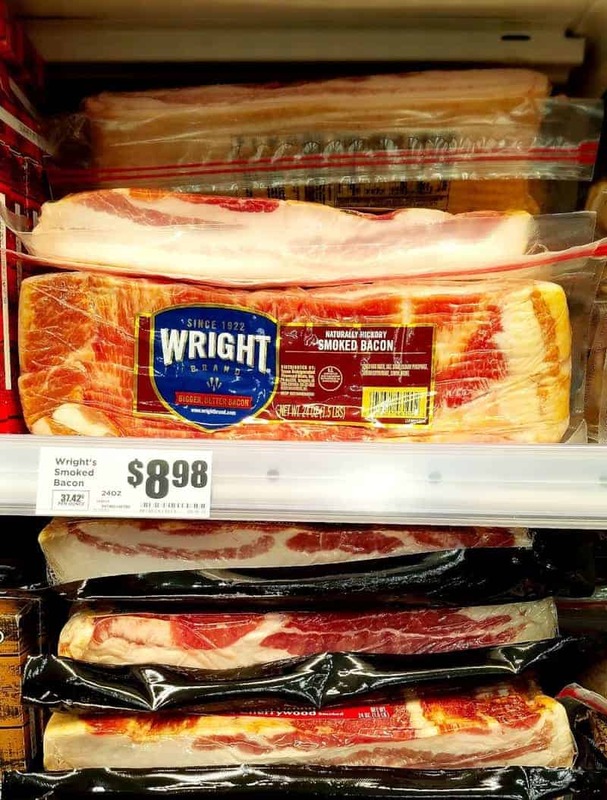 All the ingredients, including Wright® Brand Hickory Bacon, are conveniently available at HEB , requiring just one trip to your nearest HEB store! It’s a bacon and cheese recipe, and while it runs away from the trivial, it’s still easy to prepare. 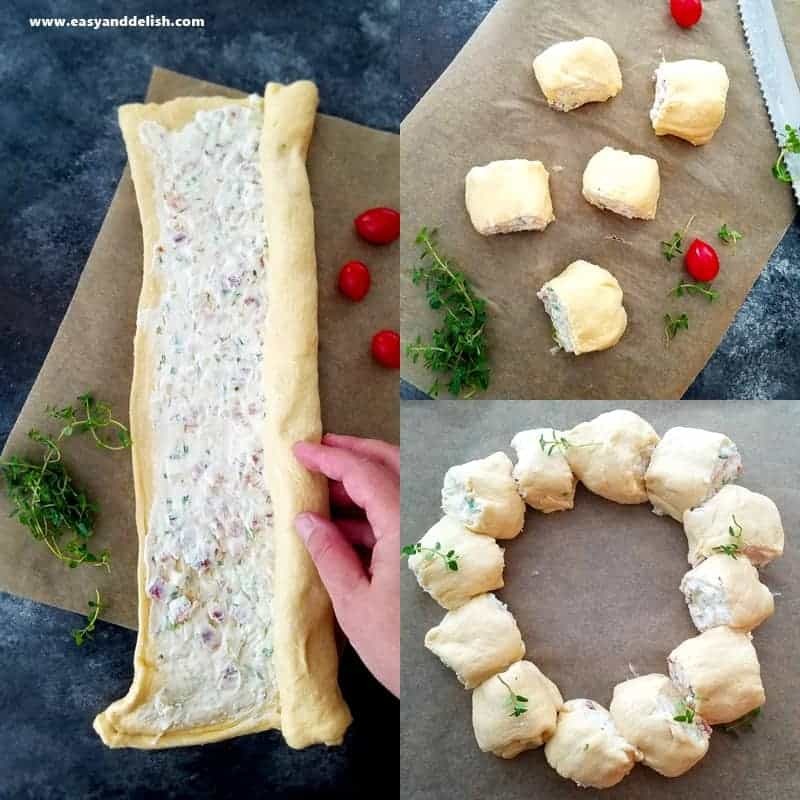 All we have to do is to unroll a refrigerated crescent dough sheet, spread a mixture of cream cheese, onions, chives and chopped cooked bacon, roll up the dough, and then cut into slices. Next, arrange them like a ring and bake. See? Easy peasy! The kids can still get in on the fun. They can decorate the Baked Bacon Cream Cheese Breakfast Ring with ranch dressing, chopped cooked bacon, and chives. 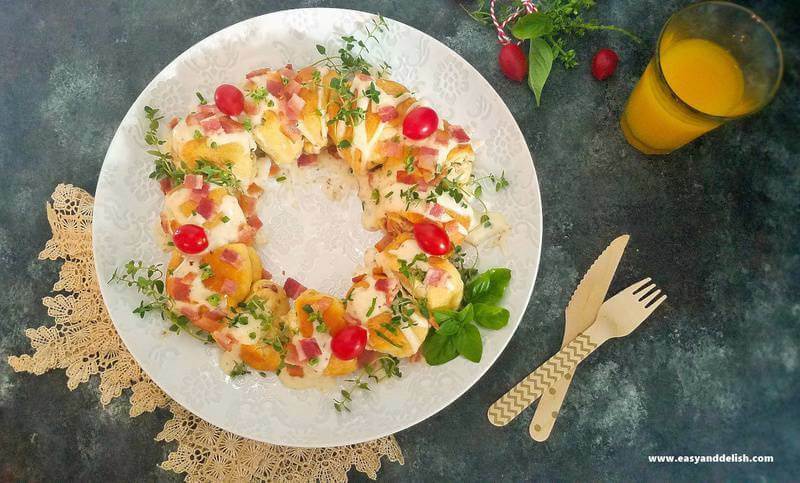 It is reminiscent of a holiday wreath… but even better, this one is edible! Do you think they will forget those moments any time soon? That is exactly what we can do with Tyson® products, which as you can see are perfect for all cooking occasions, all holiday season long. They are the key ingredient to recipes that can be enjoyed any time of day during the busy holiday season and beyond. 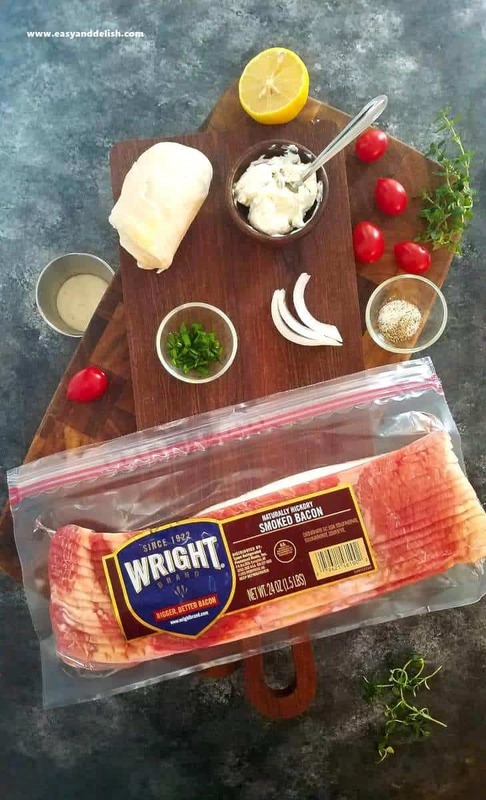 Our easy and flavorful recipe includes their Wright® Brand Hickory Bacon, a versatile ingredient that goes well in a huge range of dishes. It shines in many meals, in multiple ways, and always brings joy. I call it the all-time crowd-pleaser, the real deal! I think y’all know it! Of course, it had to be part of the first meal of the joyful season… and many more! 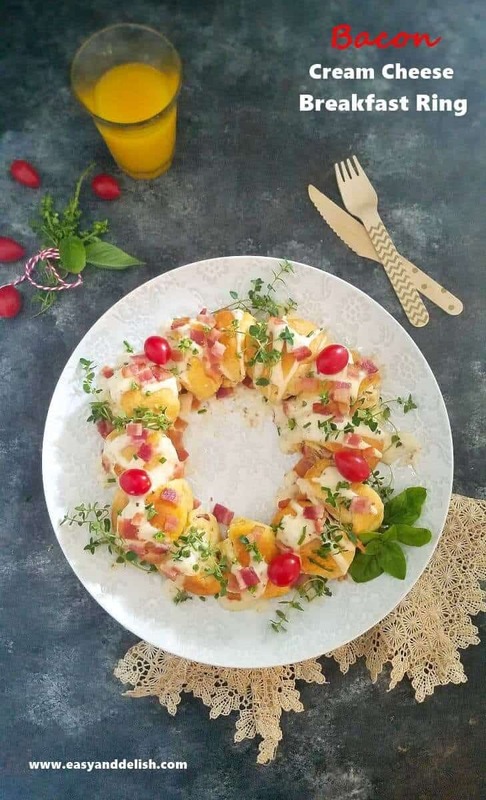 Although I like making this breakfast ring for my Christmas breakfast and serving right before we open the presents, I have also served it on other occasions. It is also perfect for brunch and even as an appetizer for sports games! I use the same ingredients, follow the same recipe but decorate the ring according to the occasion. It is already on that must-make list of dishes! Try it and I am sure it will be added to yours too. I would also be thrilled to hear about your favorite holiday and year-round bacon dishes. What are they? 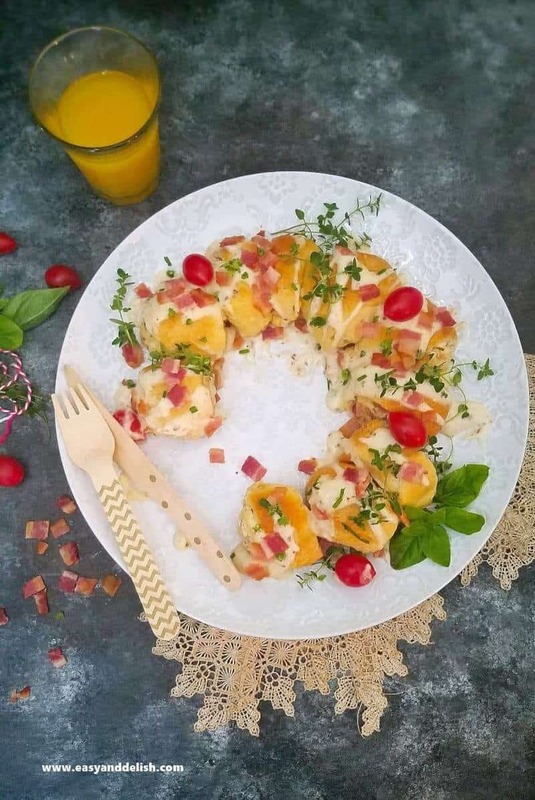 Bacon Cream Cheese Breakfast Ring is an easy and delicious eye-popping dish made from bacon, onion and chive cream cheese, and crescent dough. It is perfect for holidays and other occasions! Preheat oven to 350°F. Line a baking sheet with parchment paper or spray with cooking spray. Set aside. 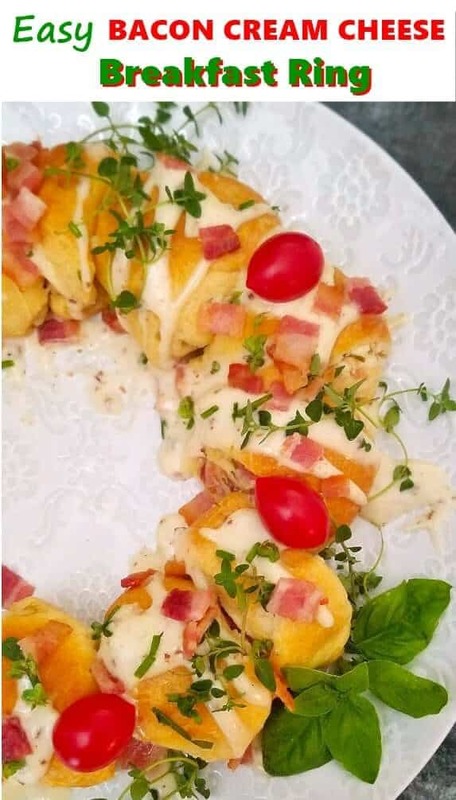 In medium bowl of an electric mixer, mix cream cheese, cooked and chopped bacon (reserve a bit to garnish on top of the ring), lemon juice, chopped onion and chives, salt, and pepper on medium speed until well blended. Unroll crescent dough sheet and then spread the cream cheese mixture on rectangle to within 1/2 inch of edges. Starting with one long side of rectangle, roll up and pinch edge to seal. Using a serrated knife, cut into 12 slices. Arrange slices on baking sheet in a circle, overlapping slightly. Bake for 18-20 minutes or until golden brown. Remove from the oven, transfer carefully to a serving dish, and drizzle ranch dressing on top. Garnish with chopped bacon, tomatoes, and thyme sprigs. Serve while still hot. Enjoy! Store any leftover covered in the refrigerator for up to 2 days. Heat well before eating.